Ivan, Jennifer and I checked out of the Theme Park Hotel on April 22, 2009. We took a taxi from Genting Highlands to Chinatown. It took an hour. We checked in at the Reggae Guesthouse. We put our backpacks in the room. Everybody was hungry. 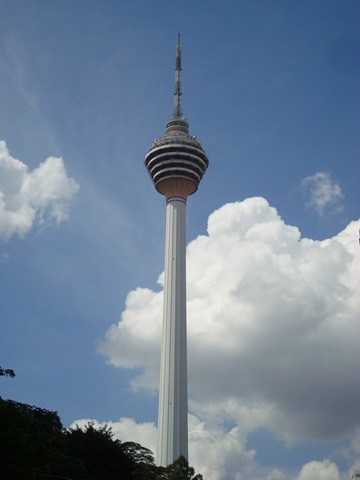 We took a taxi to the KL Tower. Ivan wanted to do the buffet lunch. 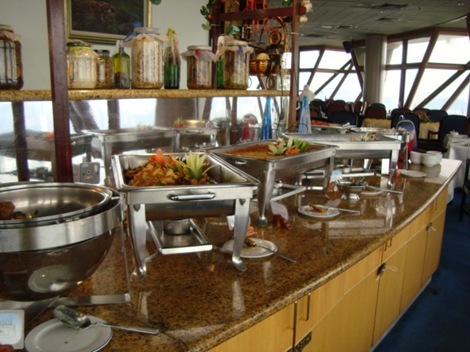 It’s only a little bit more money for the buffet lunch at the Seri Angkasa revolving restaurant. It includes the price of the tower admission. It’s nice seeing the view while sitting down and eating. Also, it’s not as crowded. The tower is fourth largest communication tower in the world. It’s not as tall as the Petronas Twin Towers. But, the view is higher in the KL Tower. 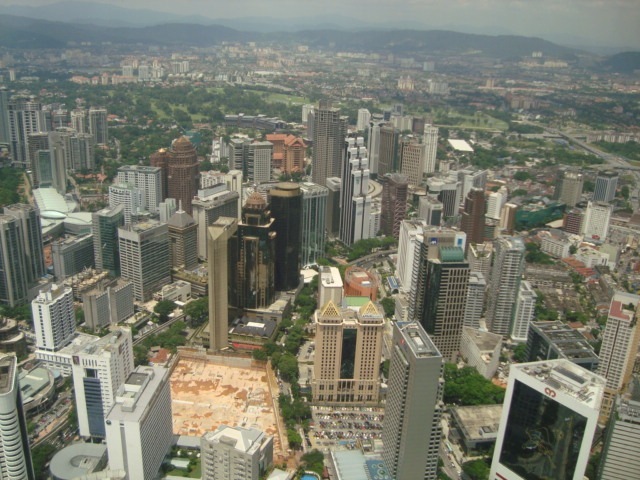 The Petronas Twin Towers view is only a third of the way up the building. We were seated at a table right by the window. The restaurant revolves. We went to get some food. I had to add banana to my dishes. 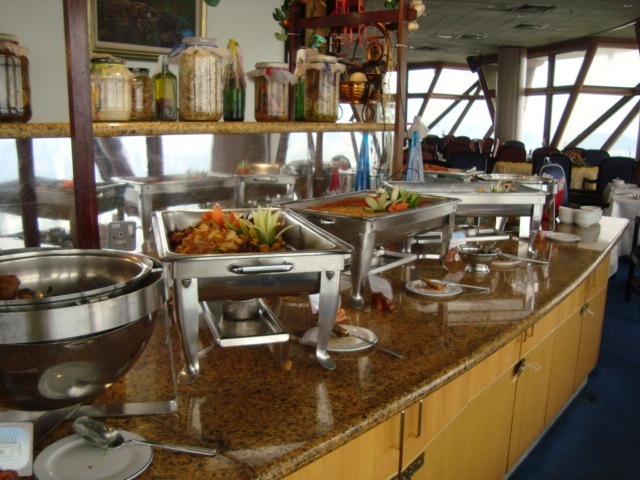 The buffet had good items with a mixture of Indian and Malaysian. The view was fantastic! It’s great to see a whole city from up high. We went to the viewing platform. I think the view is better at the restaurant. It was pretty crowded too. We left to walk back. We walked back to the guesthouse. We chilled at the guesthouse. I worked on the blog. Ivan and Jennifer used the internet at the guesthouse. We took a taxi to the restaurant La Bodega. It was a late dinner for us. The restaurant was filled with people. I had a traditional Spanish banana soup. I also had some fried banana fritters. It tasted good. Ivan and Jennifer ordered okra salad with cajun spiced chicken, spicy chili dip with paprika (which come with baguettes), eggplant braised in olive oil chili and herbs, button mushrooms sauteed with olive oil & garlic, grilled sardines with garlic & parsley and chicken yakitori with aioli sauce. They also ordered sangria. 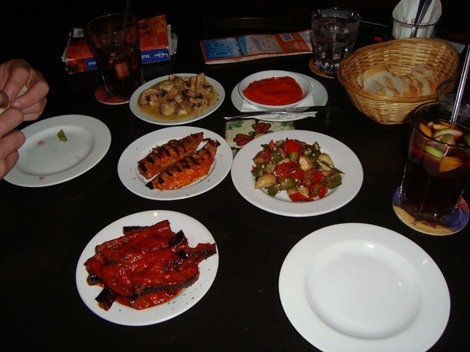 Most of the dishes were good. Well, I’m a monkey.. so I don’t pay for the accommodation. I list some prices sometimes. But, I really don’t write down the prices.